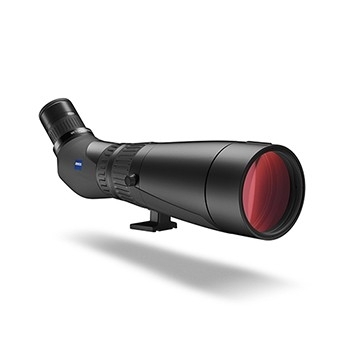 This spotting scope combines a revolutionary new optical system with a 3-stage wide angle zoom providing a constant field of view over its entire magnification period. The combination of up to 70x magnification with the choice of either 85 or 95mm objective lenses delivers easy and unobstructed views into open space. The ZEISS DualSpeed Focus facilitates quick, exact focusing, even at high magnification. (There is no straight eye piece model available).